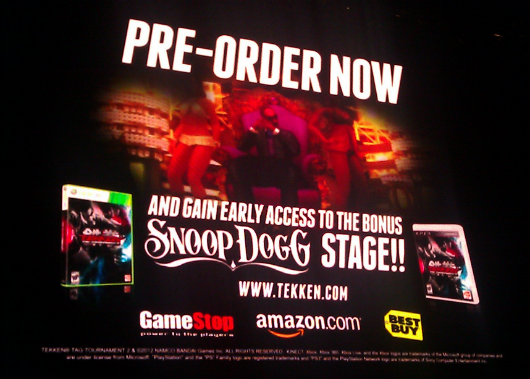 Namco Bandai announced at its E3 2012 Event that Snoop Dogg will have a special stage inside Tekken Tag Tournament 2. The stage features Snoop Dogg watching the fight in a throne, surrounded by scantily clad dancers and a doberman. Pimptastic to say the least. Players (or “playa’s” if you will) who preorder the game at certain retailers will be able to have his stage unlocked early as a bonus. Snoop Dogg, who appeared at the E3 event proudly told the audience that “Tekken has always been a special game to me.” He also said that he appreciated the series for its realistic “street fighting” and for not being a “gimmick”.